When you go to a museum, they have a very clear idea about how art should be experienced: You follow a pre-defined route through several anti-septic rooms, and take a short glimpse on far too many exhibits, and move on quickly. Everything is labeled meticulously with the artist name and the creation date. You are currently being monitored. "Do not sit down here! Do not touch! Drinking is not allowed! No photographs!" When I was at the Rijksmuseum last Thursday, I saw a lot of exhausted people, who seemed to visit the museum just to check an item on their to-do-list (The Rijksmuseum is number four on the list of sites in Amsterdam, according to TripAdvisor). About a million people visit each year, or in another words, one visitor every ten seconds. I witnessed dialogues like "Can we go now?" - "No, we have to see the Vermeer on the first floor!" - "Ugh." It seems like we measure art not by the benefit it creates for us individually, but by rather objective measures like what art critics say or how much something is worth in money, or how famous the creator is. This is not how it should be, so the Rijksmuseum has added an alternative approach called "Art is therapy": They have added giant yellow post-its next to 69 exhibits, each containing a short idea about how to find a more personal access to a work of art, a style they call philosophical graffiti. 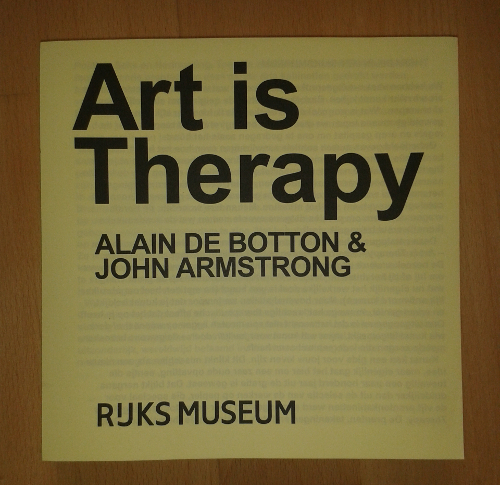 I bought the accompanying book at the museum shop, but you can also buy the book at the Rijksmuseum webshop. 1. "I don't know what to do in front of a picture"
"We're often not a hundred percent sure what we're supposed to do in an art museum (other than stay quiet and look out for the artist’s name), and our lack of direction means we easily get bored. But there is one thing in particular we can do to keep ourselves entertained. In public spaces, especially in restaurants and pavement cafes, it can be fun to speculate about what the people around us are like, what their lives might hold, what it might be like to be their friends and how their relationships might be going. 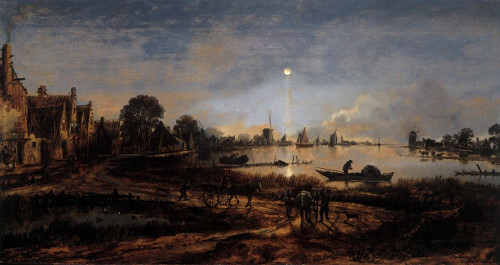 This kind of speculation is also more than suited to the study of certain pictures in museums. Though this is far from the case now, the value of this activity should be up there with learning dates and historical inﬂuences. 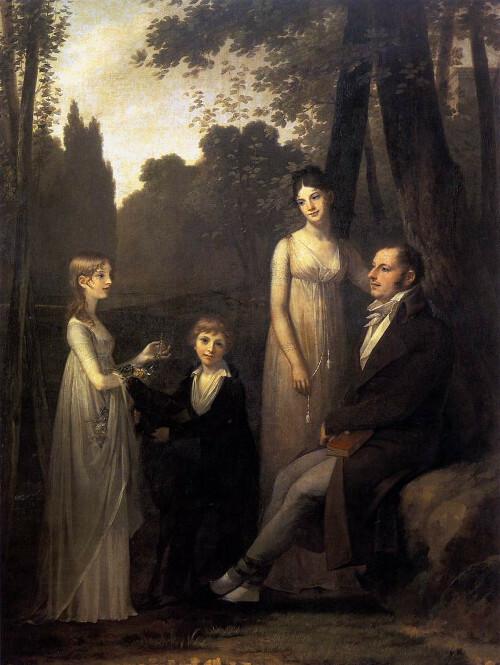 In the case of this painting, look past the slightly unfamiliar clothes and odd woodland setting, and you have four people who invite, and reward, imaginative enquiry perfectly as to their personalities. The wife looks like someone who would be unafraid of administrative tasks, tolerant of minor failings (though skilled at knowing when to draw the line), outwardly gentle yet inwardly robust and tough when necessary. She might be just the person with whom to share a somewhat humiliating career anxiety. As for her husband, he seems thoughtful and sensitive while still capable of getting the job done and staying realistic, a balancing act he perhaps got better at pulling off when he married and came under his wife's good inﬂuence. This is only a rough start... you can carry on, here and with other works - and then the next time you are sitting in a cafe." 2. "Nothing interesting ever happens to me"
"We've all known nights a bit like this. The ordinary preoccupations of the day recede and, away from the familiarity of home, you access unfamiliar, yet important, parts of yourself. You feel a freshness and openness to new experiences. You feel curious, unafraid and thoughtful, out there in the world at 3 am. The artist is trying to hold on to a mood of heightened consciousness at being alone in a strange, unfamiliar, beautiful world. We feel (as we didn't during the bustling hours of the day), how odd it is to be alive and how peculiar it is to walk this earth. The majesty of the evening may prompt what could be called a religious impulse. This isn’t a desire to join an established religion, but to ﬁnd some way of expressing the strange, and powerful, conjunction of an awareness of our own isolation and fragility and — at the same time — our intense love of the beauty of the cosmos. It is an impulse that religions have taken seriously (although they have often interpreted it in unfortunate ways). It is a mood that we all know but generally neglect. We don’t go there enough; we leave it to chance. We should be more strategic and set up the opportunity: ‘There's a bright moon tomorrow, let’s go for a walk by the river at 11.15 in the evening'. The picture bottles the mood and helps us remember it (getting the postcard might quickly return us to it). It makes it communicable: in the future you might be able to say, I had a Van der Neerish experience — and a friend who had seen the picture would understand." 3. "I can't bear busy places - I wish this room were emptier"
"You're in a crowd of hundreds, and you're looking at a picture of a crowd of people. But there’s a difference. Your crowd is anonymous and the enemy of good things happening. Ideally, you'd like to be alone, while, in the picture, their comradeship is bringing a glow to a dark, rainy day. Imagine you are with them, part of the Night Watch. You're going out in dreary weather to deal with the drunks, move on the troublemakers and keep an eye out for thieves and burglars. It's going to be great. It beats being at home, because you're doing it with your friends. It’s a picture of how nice it is to be doing something with people you like. 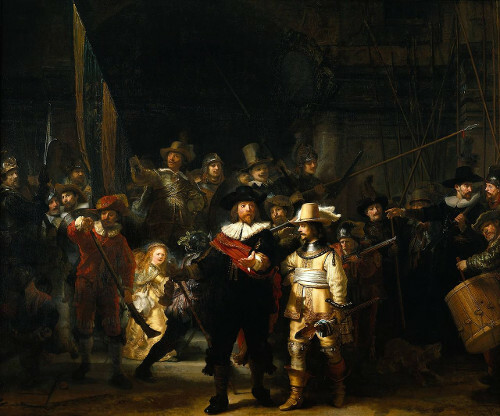 The Night Watch — which is perhaps the most revered picture in the country — speaks of the appeal of joining in; they are going to do something that is hardly appealing in itself - patrolling the streets on a foul day — but how readily we would join them if we could. Companionship is so much more important than ease and comfort. It is a terribly poignant message: for here we are in this room, in a crowd, yet without a collective purpose. They — in the picture - are what we should be, and what, in times of honesty, we wish we could be: a band of brothers, a true team, people who will bring out the best in one another. Strange though it might sound, this picture is about loneliness, for it tells us what we are missing when we feel lonely. And getting to know what our loneliness is about is the ﬁrst step to lessening its pangs."